He had that look of stoic anger, his lips drawn together tightly and his face contorted and focused. He never spoke, never even looked at you, apart from a cursory glance and nod as he took your order. You could tell he was angry by the way he banged everything loudly. The cups, the spoons, the plates, all thumped down to remind you that he existed and what you saw wasn’t really him. He shouldn’t have been a café owner, serving breakfasts to the itinerant workers and passing office staff. Inside he was an artist, a painter, a writer, perhaps an opera singer. This was all an illusion and he wanted you to know it. He was about fifty with grey, receding hair. He wore large glasses that accentuated his eyes and he had this way of staring right through you, as if you weren’t there. He wore a grubby, open-necked, short-sleeved, white shirt and you could just make out the top of his vest, sweaty and stained. He spoke sparingly, a mixture of English and Italian and moved about almost militarily behind the Formica-topped counter adorned with pictures of Diana’s special breakfasts, risottos, omelettes, and fish and chips. 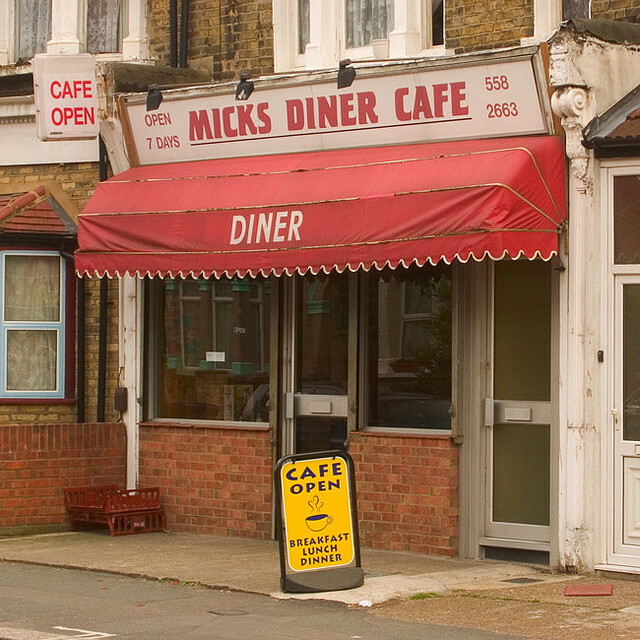 The café was jaded, a throwback, almost a greasy spoon. All the walls had posters of London stars, Anita Dobson, cleavage accentuated; Anthony Quinn holding a machine gun; Bob Hope smiling at some Red Indians. It had obviously been his Dad’s and that’s perhaps why he felt so bitter. He never wanted this, but it was tradition and his father’s legacy. A dumb waiter was the centrepiece, operated by a black pulley, which he yanked with all his might. He would fill it with plates, stacked high, and then lower it methodically to the depths below. It would return full of steaming dishes, which he would distribute to his clientele with a perfunctory Enjoy. He never smiled but his regulars just nodded and devoured it quickly. The glass cabinet under the counter was Spartan to say the least. A huge slab of cheddar that had seen better days, some coleslaw, tuna mayonnaise, and an overcooked sausage that begged to be eaten. Specials were chalked on a blackboard-tuna grilled-£7; liver and chips with gravy-£8.50; chilli con carne £4.50, lasagne £5.00 and the chef’s special of the day- £3.50. A picture of an English lady lounging in front of a window was nailed to the wall, together with a Union Jack and a drooping plastic orchid that yearned for attention. There was no frivolity, no banter. Just the clank, clank, clank of his banging the plates, the chomping of mouths eager to leave as quickly as possible and the backdrop of the pulley moving upwards and downwards. He paused momentarily, opened a crumpled cardboard box and produced a small red Santa. He placed it on the counter next to the tip box and squeezed it gently. Ho, Ho, Ho it croaked. He tried to force a smile but his lips moved only slightly before returning to their normal fixed position. Outside, the boutique cafes filled with businessmen sipping their lattes and Americanos. Young female office workers strolled nonchantly by, their phones pressed against their cheeks. An audio version of this short story appeared on Cursive Script’s 2nd podcast, “Tales of Winter”. Photo Courtesy of Flickr user matsimpsk.